Some of the adolescent patients of chronic acne, some women aged 25–40 years, and particularly, patients with psychiatric diseases (primary or secondary to acne) have disproportionately severe acne and its attendant psychosocial distress. Although no consensual clinical gold standard regarding the severity of acne exists despite abundance of scales developed over six decades, global acne grading system is used most commonly. The “subjective” psychosocial consequences of acne can be better evaluated by self-assessed health-related quality of life (QoL) tools than the traditional clinical assessment by the physician. The correct interpretation of these tools such as health status surveys (generic and specific) and preference-based measures, requires adherence to the rules regarding reliability, validity, sensitivity, and complete transcultural adaptation. The Cardiff Acne Disability Index is the most commonly employed specific health state survey for acne. Comprehensive therapy addressing the severity of acne as well as the resultant impaired QoL concomitantly can, fortunately, mitigate negative mental symptoms; this mitigation may even be proportional to the clinical remission. In addition, the routinely integrated practice of these twin measures may also speed up patient encounters by inculcating perspicacity in the treating physician. Acne vulgaris is a complex, multifactorial disorder of the pilosebaceous unit, almost ubiquitous (~90%) in teenagers, half of whom continue to suffer from it during adulthood. It is not only the most common diagnosis made by, and the leading cause of visits to, the dermatologists but also a common presentation to the non-dermatologists., All components of the definition of chronicity of disease by the WHO, namely, a prolonged course, a pattern of recurrence or relapse, manifesting as acute outbreaks or slow onset, and a psychological and social impact affecting the individual's quality of life (QoL) exist in many patients of acne vulgaris contributing considerably to their disease burden., Therefore, conjoint integration of measures of the skin damage and impaired QoL should be a sine qua non during the planning of comprehensive management of acne; the lesions treated as per their grading and the impairment in QoL, by appropriate in-depth counseling, psychotherapy, and/or psychopharmacotherapy, including, where required, by a psychiatrist. The negative psychosocial impact of acne on QoL – often “subjective” and understated – correlates only partially with the traditional “objective” measures of its severity. Nonetheless, its reversal occurring “proportionally” to the improvement in the severity of acne further justifies the simultaneous resolution of impaired QoL and acne severity for the best therapeutic outcomes. The severity of acne has been assessed by numerous tools [Table 1]; only a few of these appear to have been validated and their reliability, seldom documented. Certain “issues” that continue to preclude identification (out of at least 25 scales for assessing the global severity of acne and more than 19 methods for counting lesions) of the development of a consensual singular gold standard for severity of acne , are first: lack of an “all or none” response, drugs diminishing some rather than eliminating all lesions; second: subjectivity of multiple variables on which estimation of severity are based, for examples, dominant lesions, presence or absence of inflammation, and extent of involvement; third: overly simplistic division into four grades of severity; fourth: non ascertainment of the depth of involvement and nonvisualization of small pustules and comedones, minimization of erythema, excoriations, and dyspigmentation by photographic standards; fifth: complicated equipment and problems inherent to fluorescence and polarized-light photography, for example, nondiscrimination between macules and papules and incomplete visualization/under-recording of small comedones and excessive time involvement; and last: considerable time consumed in counting/quantifying of lesions. 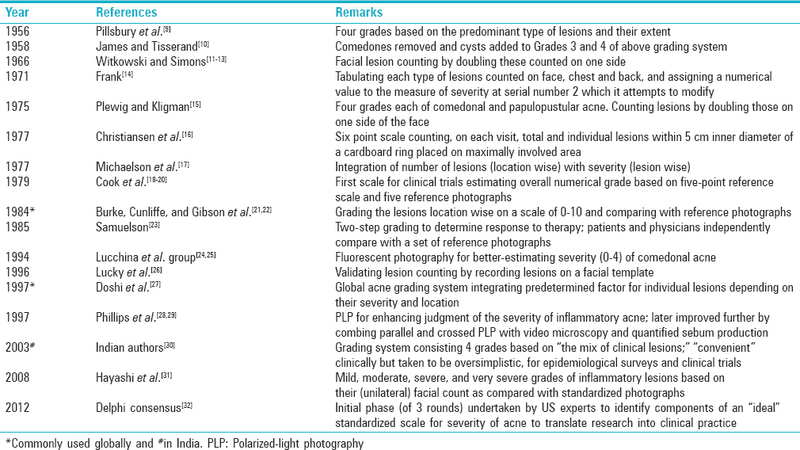 Ten experts based on the United States - tasked to identify/develop a standard for acne severity so as to facilitate translation of research findings into clinical practice - concluded, after three rounds of initial phase of the established iterative (Delphi) process  that an ideal acne scale should have features regarding clinimetric properties, categorization, efficiency, and acceptance and clinical components such as quantity, extent, and (facial and extrafacial) sites of primary acne lesions. Further, the panel-identified clinical components for evaluation were primary lesions (inflammatory and/or noninflammatory); secondary lesions (scarring, pigmentary changes, excoriations, postinflammatory erythema; together, or separately); quantity of lesions (through counting, numerical ranges such as 0–10 or 11–40, verbal descriptors such as few or many); extrafacial sites (chest, back, neck, and shoulders); extent (through proportion descriptors such as one-third or entire, percentages at each site, general descriptors such as minimal or somewhat) of involvement; and patient experiences (acne-related QoL, treatment-related bother). There being no base reference for QoL studies – unlike the traditional mandatory requirement of evaluation of the specificity of the clinical and biological measurement tools in relation to reference measures – its questionnaires must respect certain rules regarding reliability, validity, sensitivity, and complete transcultural adaptation for correct interpretation of their outcomes. Reliability, first evaluated in terms of reproducibility (test-retest), implies similar outcomes among different studies in the presence of stable state of health. In the event of evolving health state, another procedure such as the Kappa test may prove useful. If, as is usually the case, a questionnaire consists of multiple items, an “internal consistency analysis” becomes mandatory. Validity, the tool's capacity to correctly measure that for which it was designed, is of two types [Table 2] and its assessment is complex; first, because of its dependence upon context and second, because of impossibility of proving absolute validity of an instrument. The authors of the tool must develop the questions meticulously and word them unequivocally facilitating identical comprehension by the patient and thereby, success of the content validity. Besides having sensitivity, a QoL instrument must also be capable of assessing the evaluation of emerging events consequent to therapy. As most QoL tools have been developed by the Anglo-Saxons and validated in their sociocultural milieu, mere translation of a questionnaire without making changes in respect of the new context is not enough for its application, in another context. The steps of the complete transcultural adaptation in a new country are as tabulated [Table 2]. These “instruments” capture comprehensive effect of a specific condition on various aspects of QoL and comprise generic measures – applicable broadly across medical conditions, for example, Short-Form 36 Health Survey – to disease-specific ones. The latter, however, unlike the general health instruments cannot compare different diseases. The Cardiff Acne Disability Index is the most commonly used specific QoL instrument for acne [Table 3]. These instruments are based on the methods that allow patients to theoretically give up something of value (money, time, life, by risking death, etc.) in order to not have the disease in question. These measures, by providing easy to compare numerical values across different disease states, are important for resource allocation and funding for pharmacoeconomic valuations. These outcomes can be divided into utilities and contingent valuation; the former, numerical values, reflecting levels of subjective satisfaction, distress, or desirability that people associate with a particular health state are expressed on a scale anchored at death (utility = 0) and perfect health (utility = 1). The willingness-to-pay (WTP) method, the most common instrument of the contingent valuation, requires respondents to reveal the highest monetary burden acceptable to them for an imagined market of a health program or benefit. WTP is specifically used in pharmacoeconomic cost–benefit analyses. Why is it Imperative to Conjointly Integrate Measures of Severity of Acne and Impairment of Quality of Life into Planning of Treatment? Severity of acne, though an important clinical parameter for characterizing/classifying patients for epidemiological surveys and for establishing recommendations for treatment, is neither a “complete” nor a reliable indicator of individual psychosocial distress – particularly common in adolescents having acne on the face – reported to be comparable to that found in patients of other chronic disabling diseases such as asthma, epilepsy, diabetes mellitus, back pain, and arthritis; this distress may disproportionately affect relationships, communication, psychological well-being, and elicit emotional symptoms such as depression, anger, anxiety, hostility, and shame with negative effects on interpersonal relations. Adult women – often 25–40 years of age and dealing with issues of motherhood, adult sexuality, career demands, and aging – are another group at increased risk for psychosocial damage., Therapy-resistant or atypical (excoriee, factitial, etc.) acne may have concurrent primary or secondary (to acne) psychiatric disorders; the primary ones predispose toward “picking” behavior and include obsessive–compulsive disorders, depression and anxiety disorders, body dysmorphic disorders, borderline personality disorders, narcissistic personality disorders, and delusions of parasitoses. The secondary psychiatric disorders, for example, anxiety, anger, and depression may be indicative of individuals at risk for adverse psychiatric effects from acne of any severity. Appropriate psychocutaneous interventions which save lives by averting potentially disastrous emotional and functional sequelae in the above groups of “high-risk” patients, may benefit lower risk patients as well by improving their compliance, clinical outcomes, and eventually, the QoL. The psychosocial damage due to chronicity of acne pervades among the patients of acne universally but is significantly more in adolescents, particularly with facial acne, women in third to fourth decades of life, therapy-resistant/atypical acne, in patients with psychiatric disorders, and in body dysmorphic disorder irrespective of acne severity. Hence, instituting the management based only on the “objective” measurement of the severity of lesions is unlikely to be comprehensive in the absence of concurrent redressal of the, so called, “subjective” impairment in QoL. Psychosocial distress needs to be sought universally through HRQoL tools and incorporated conjointly with measures of acne severity for comprehensive therapy in “high-risk” patients, so as to optimize clinical outcomes and avert negative psychiatric catastrophes. Improvement in QoL also occurs in all other patients due to better compliance, improved clinical outcomes and eventually, the QoL. This effort to gauge relevant signs of psychosocial distress incorporated into routine clinical practice need not necessarily lengthen, and may actually shorten, the time spent in the patient encounters due to increase in efficiency and inculcation of perspicacity. However, this ideal scenario remains clouded due to the inability of the efforts, ongoing since over six decades, to arrive at a consensual gold standard clinical tool for measuring the severity of acne and scarce use, after transcultural adaptation, of QoL tools. Yentzer BA, Hick J, Reese EL, Uhas A, Feldman SR, Balkrishnan R. Acne vulgaris in the United States: A descriptive epidemiology. Cutis 2010;86:94-9. Pawin H, Chivot M, Beylot C, Faure M, Poli F, Revuz J, et al. Living with acne. A study of adolescents' personal experiences. Dermatology 2007;215:308-14. Stern RS. Dermatologists and office-based care of dermatologic disease in the 21st century. J Investig Dermatol Symp Proc 2004;9:126-30. Centers for Disease Control. Classifications of diseases and functioning and disability. In: Classifications of Diseases and Functioning and Disability. Definition of Disability Reference 2001. Geneva: National Center for Health Statistics; 2001. Motley RJ, Finlay AY. How much disability is caused by acne? Clin Exp Dermatol 1989;14:194-8. Griesemer RD. Emotional triggered disease in a dermatologic practice. Psychiatr Ann 1978;8:407-12. Lucky AW, Rosenfield RL, McGuire J, Rudy S, Helke J. Adrenal androgen hyperresponsiveness to adrenocorticotropin in women with acne and/or hirsutism: Adrenal enzyme defects and exaggerated adrenarche. J Clin Endocrinol Metab 1986;62:840-8. Rubinow DR, Peck GL, Squillace KM, Gantt GG. Reduced anxiety and depression in cystic acne patients after successful treatment with oral isotretinoin. J Am Acad Dermatol 1987;17:25-32. Pillsbury DM, Shelley WB, Kligman AM. Dermatology. Philadelphia: Saunders; 1956. p. 810. James K, Tisserand JJ. Treatment of acne vulgaris. GP 1958;18:131-9. Witkowski JA, Simons HM. Objective evaluation of demethylchlortetracycline hydrochloride in the treatment of acne. JAMA 1966;196:397-400. Guin J, Parish LC, Witkowski JA. The acne flow form. Int J Dermatol 1980;19:38-40. Guin JD, Witkowski JA, Parish LC. The acne questionnaire. Int J Dermatol 1980;19:36-7. Frank SB. Acne Vulgaris. Springfield, IL: Thomas; 1971. p. 12-3. Plewig G, Kligman A. Acne: Morphogenesis and Treatment. New York: Springer-Verlag; 1975. p. 162-3. Christiansen J, Holm P, Reymann F. Treatment of acne vulgaris with the retinoic acid derivative Ro 11-1430. A controlled clinical trial against retinoic acid. Dermatologica 1976;153:172-6. Michaelson G, Juhlin L, Vahlquist A. Oral zinc sulphate therapy for acne vulgaris. Acta Derm Venereol 1977;57:372. Cook CH, Centner RL, Michaels SE. An acne grading method using photographic standards. Arch Dermatol 1979;115:571-5. Wilson RG. Office application of a new acne grading system. Cutis 1980;25:62-4. Blaney DJ, Cook CH. Topical use of tetracycline in the treatment of acne: A double-blind study comparing topical and oral tetracycline therapy and placebo. Arch Dermatol 1976;112:971-3. Burke BM, Cunliffe WJ. The assessment of acne vulgaris – The Leeds technique. Br J Dermatol 1984;111:83-92. Gibson JR, Harvey SG, Barth J, Darley CR, Reshad H, Burke CA. Assessing inflammatory acne vulgaris – Correlation between clinical and photographic methods. Br J Dermatol 1984;111 Suppl 27:168-70. Samuelson JS. An accurate photographic method for grading acne: Initial use in a double-blind clinical comparison of minocycline and tetracycline. J Am Acad Dermatol 1985;12:461-7. Lucchina LC, Kollias N, Phillips SB. Quantitative evaluation of noninflammatory acne with fluorescence photography. J Invest Dermatol 1994;102:560. Lucchina LC, Kollias N, Gillies R, Phillips SB, Muccini JA, Stiller MJ, et al. Fluorescence photography in the evaluation of acne. J Am Acad Dermatol 1996;35:58-63. Lucky AW, Barber BL, Girman CJ, Williams J, Ratterman J, Waldstreicher J. A multirater validation study to assess the reliability of acne lesion counting. J Am Acad Dermatol 1996;35:559-65. Doshi A, Zaheer A, Stiller MJ. A comparison of current acne grading systems and proposal of a novel system. Int J Dermatol 1997;36:416-8. Phillips SB, Kollias N, Gillies R, Muccini JA, Drake LA. Polarized light photography enhances visualization of inflammatory lesions of acne vulgaris. J Am Acad Dermatol 1997;37:948-52. Rizova E, Kligman A. New photographic techniques for clinical evaluation of acne. J Eur Acad Dermatol Venereol 2001;15 Suppl 3:13-8. Tutakne MA, Chari KV. Acne, rosacea and perioral dermatitis. In: Valia RG, Valia AR, editors. IADVL Textbook and Atlas of Dermatology. 2nd ed. Mumbai: Bhalani Publishing House; 2003. p. 689-710. Hayashi N, Akamatsu H, Kawashima M; Acne Study Group. Establishment of grading criteria for acne severity. J Dermatol 2008;35:255-60. Tan J, Wolfe B, Weiss J, Stein-Gold L, Bikowski J, Del Rosso J, et al. Acne severity grading: Determining essential clinical components and features using a Delphi consensus. J Am Acad Dermatol 2012;67:187-93. Lehmann HP, Robinson KA, Andrews JS, Holloway V, Goodman SN. Acne therapy: A methodologic review. J Am Acad Dermatol 2002;47:231-40. Stathakis V, Kilkenny M, Marks R. Descriptive epidemiology of acne vulgaris in the community. Australas J Dermatol 1997;38:115-23. Pochi PE, Shalita AR, Strauss JS, Webster SB, Cunliffe WJ, Katz HI, et al. Report of the consensus conference on acne classification. Washington, D.C. March 24 and 25, 1990. J Am Acad Dermatol 1991;24:495-500. Deyo RA. The quality of life, research, and care. Ann Intern Med 1991;114:695-7. Wilson IB, Cleary PD. Linking clinical variables with health-related quality of life. A conceptual model of patient outcomes. JAMA 1995;273:59-65. Greenfield S, Nelson EC. Recent developments and future issues in the use of health status assessment measures in clinical settings. Med Care 1992;30 5 Suppl: MS23-41. Raymond JM. Why and how to carry out studies of quality of life in gastroenterology? Gastroenterol Clin Biol 1996;20:1067-70. Finlay AY. Quality of life indices. Indian J Dermatol Venereol Leprol 2004;70:143-8. Motley RJ, Finlay AY. Practical use of a disability index in the routine management of acne. Clin Experiment Dermatol 1992;7:1-3. Gupta A, Sharma YK, Dash K, Verma S. Cultural adaptation of the Cardiff Acne Disability Index to a Hindi speaking population: A pilot study. Indian J Dermatol 2015;60:419. Layton AM, Seukeran D, Cunliffe WJ. Scarred for life? Dermatology 1997;195 Suppl 1:15-21. Gupta MA, Johnson AM, Gupta AK. The development of an Acne Quality of Life scale: Reliability, validity, and relation to subjective acne severity in mild to moderate acne vulgaris. Acta Derm Venereol 1998;78:451-6. Girman CJ, Hartmaier S, Thiboutot D, Johnson J, Barber B, DeMuro-Mercon C, et al. Evaluating health-related quality of life in patients with facial acne: Development of a self-administered questionnaire for clinical trials. Qual Life Res 1996;5:481-90. Barnes LE, Levender MM, Fleischer AB Jr., Feldman SR. Quality of life measures for acne patients. Dermatol Clin 2012;30:293-300, ix. Fabbrocini G, Lauro C, Izzo R, Mazzella C, Di Bonito M, Piccolo A, et al. Acne radar: A new intuitive graphic visualization of quality of life in acne patients. J Plast Dermatol 2013;9:1-8. Torrance GW. Measurement of health state utilities for economic appraisal. J Health Econ 1986;5:1-30. Drummond MF, O'Brien BJ, Stoddart GL, Torrance GW. Methods for the Economic Evaluation of Health Care Programmes. 2nd ed. New York: Oxford University Press; 1997. McCombs K, Chen SC. Patient preference quality of life measures in dermatology. Dermatol Ther 2007;20:102-9. Mallon E, Newton JN, Klassen A, Stewart-Brown SL, Ryan TJ, Finlay AY. The quality of life in acne: A comparison with general medical conditions using generic questionnaires. Br J Dermatol 1999;140:672-6. Gupta A, Sharma YK, Dash KN, Chaudhari ND, Jethani S. Quality of life in acne vulgaris: Relationship to clinical severity and demographic data. Indian J Dermatol Venereol Leprol 2016;82:292-7. Phillips KA. Body dysmorphic disorder: The distress of imagined ugliness. Am J Psychiatry 1991;148:1138-49.